Tony LaRussa Baseball II combines both arcade play and manage-only options and is an update of Tony LaRussa Ultimate Baseball. (Hmm, notice the name change -- I guess Ultimater did not have the right ring! LaRussa II is significant improvement from its predecessor, in both accuracy and playability, and is far superior to the challenger of its day -- Earl Weaver II. The game comes with 26 all-time franchises consisting of the best to have played for each team. For instance, the Yankees have Ruth, Dimaggio, Munson, Guidry, etc, using best season stats. This allows you to simultaneously compare groups of players with each member at his peak. LaRussa II also includes 26 great past teams through 1968 like the '27 Yankees, '55 Dodgers, '46 Cards and Red Sox, as well as two all-time all-star teams. Play occurs in nine old-time stadiums: Comiskey, Ebbets Field, the Polo Grounds, Crosley, Forbes, the Baker Bowl, LA Coliseum, Griffith, and generic grass and turf parks. You can play an exhibition game in any stadium, and assign any as a team's home. If you want the current 28 parks, you must purchase the stadium add-on. The ballpark graphics were a primary attraction, and are excellent. You will best feel the environment when a ball is hit to the outfield. You can choose to play, manage, or have the computer manage, one or both teams. You can play with two on the same computer (keyboard, mouse, two joysticks supported). You can also choose a fast play mode which hustles through a 162 game, 28 team season less than a minute on today's machines. In manage or computer mode, you can opt for single pitch, which reduces game times to about 30 minutes. The graphics and sound support are strong for 1993. Players are a touch small, but are portrayed with the correct color and handedness and move believably. They are reminiscent of Front Page Sports: Baseball. There are some goofs like the batter running inside the firstbase line, but nothing catastrophic. LaRussa II was released before the CD-only storm, and has multimedia effects well suited to its time. For example, the Ron Barr play-by-play will intone "Next batter, the leftfielder", or "Caught by the shortstop!" 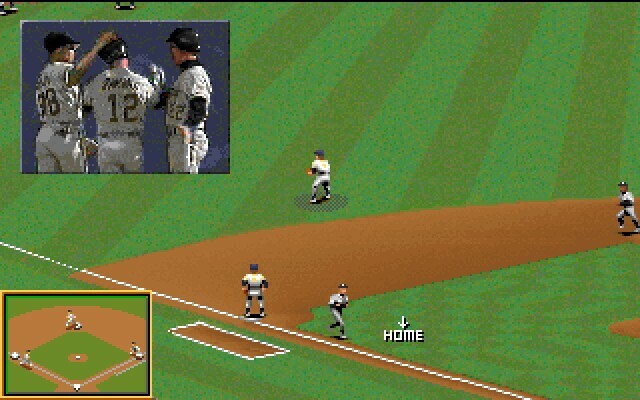 I'm most interested in season recreation, and I'm very much a baseball-stat purist, but I was also interested in a graphically pleasing game, with the occasional foray into playing. So I'll concentrate on the former, but will add my impressions of arcade action. Season recreation is a simple process. You can create leagues with up to two separate leagues, two divisions, 8 teams in each. Set season length to any desired, fast-playing up to a specified date. You can have it stop to let you play a particular team. You can save boxscores of all games, one team's, or where certain special events happen (no-hitter, 3+ homers, etc). You can set lineups vs lefty and righty, set 4 or 5-man rotations. A manager's profile, consisting of 15 different tendencies, can be tailored for each team. Rosters consist of as many as 40 players with 25 active until Sept 1. 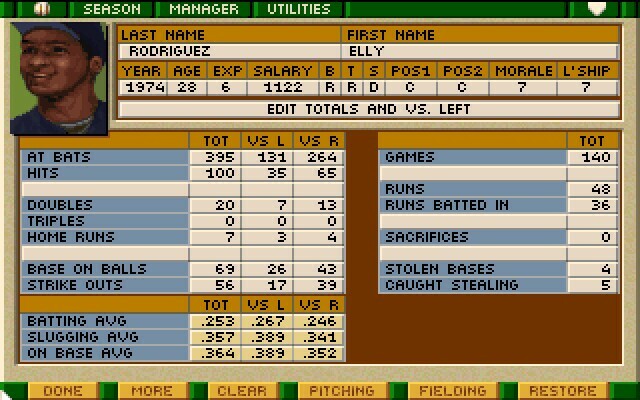 The game includes many stats and ratings. There are provisions for L/R splits, and percentages of grounders vs flyballs and pull vs opposite field. Through lack of data for oldtimers, some stats, and ratings for moral, leadership, and streakiness, day/night split, and individual pitch effectiveness are all set at default values. All pitchers are rated for control, velocity, fastball, curveball, changeup, and include a specific fourth pitch (knuckler, screwball, split-finger, but usually slider). Ballparks are unique and have individual wall dimensions, altitude, humidity, temperature, wind direction and velocity, which affect play. In a similar vein, I recreated many seasons to examine the stat reproduction. Admittedly, it is impossible to say what would happen when you mix so many stars, and from such different eras. But on the whole, stats come out reasonably -- LaRussa II has no problems here! You have the option of allowing the computer to control fielding, throwing, and/or baserunning. In fielding, you move the computer selected nearest player to a circle which shows where the ball will land, with the option of hitting the "enter" key to leap/dive. One cute effect is watching the circle drift with the wind. Throwing, too, works well, as you control which base to throw to, or whether to cutoff. As you make the selection only after the fielder has it, you must react fast! In hitting, you have an effective POV -- as seen from the catcher, though discerning the pitch type and location can be challenging. You time your swing, and choose whether to go for contact, power, normal, bunt, or take a pitch. You also choose hit & run and stealing from the on-screen hitter menu, though these are not used when controlling runners. Pitching options include selection from the four pitches, then location LaRussa II easily outstrips Earl Weaver in that a pitcher can't curve the ball the opposite way of a curveball unless he is rated for a screwball. You can also pitch out, pitch around, and attempt a pickoff. 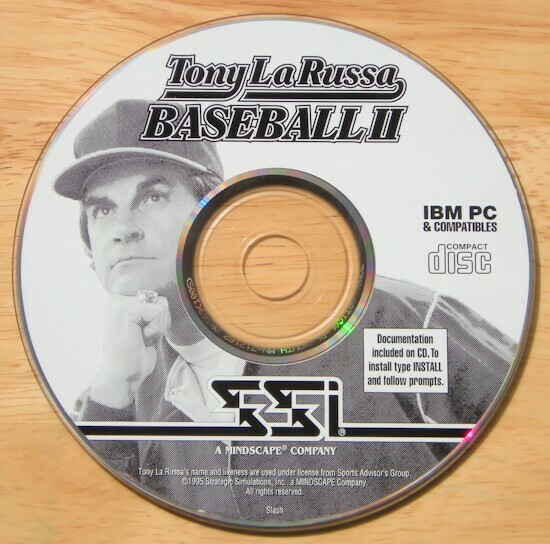 In summary LaRussa II is the best of the baseball games to combine play, manage, and season replay modes during the early 90s. It has a solid combination of stats, ratings, features, graphics, and sound. Though I'm not a big arcade player, I find the play mode refreshing and light. And when it's time to sit down and build the perfect lineup, LaRussa's vast collection of stats will serve you well. SSI took great care in the graphical aspects creating a game both pleasing to both the artist and analyst!